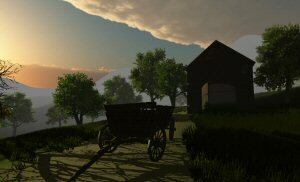 Dark Rain is an upcoming horror adventure indie game by Instant Gaming that is set in the year 1644. This game won’t be free but there’s an open beta of the first area available. The game will be a sandbox adventure where the player is free to explore the atmospheric world as he sees fit, but there’s a storyline to follow, discover some shocking setpieces and unlock new areas. A day and night cycle adds an important layer to the gameplay, with horrifying creatures coming out at night to hunt us. While everything during the day seems bucolic, there are some gruesome visions of dismembered folk. The beta doesn’t have much to do, however. There’s some roaming around and a couple of houses to explore, but without any NPCs to interact with or anything to really do (besides walking slowly away from the monsters and exploring a sewer maze), this is a nice stroll but not much more than that. Hopefully a new version will be released with some specific objectives and some insight into the – so far non-existent – story.